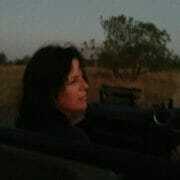 My wife and I just returned home from a week at Londolozi. We went, primarily, to see elephants. Elephants make my wife weep; they stir our souls; they touch our better natures; they illuminate profound ideas and concepts. Seeing elephants in the wild is a spiritual experience second to none. Sitting quietly observing a herd of elephants provides endless hours of enjoyment, nobility, majesty and, on occasion, insight. 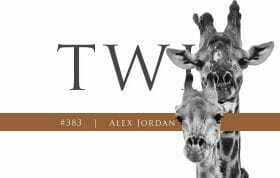 Such was our experience with a herd of about twenty we discovered late one afternoon west of camp in the Sand River. 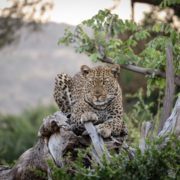 As we watched these incredible animals go about their daily functions, we became aware that there was much for us to learn about how we should live our own lives. 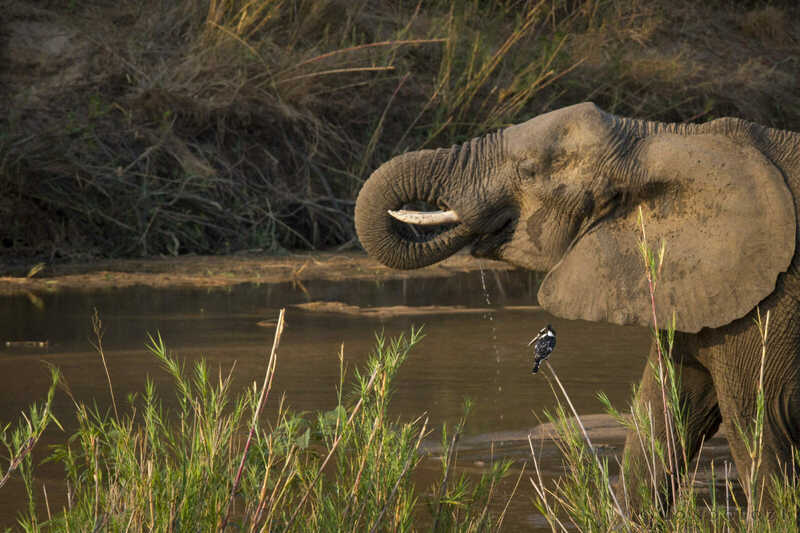 The elephants were spread out along the river, some feeding, some spraying themselves with water, some simply swaying. There were many young elephants struggling to keep pace with their mothers, trying to suckle whenever the mother stopped to feed. Included in the herd were motherless females as well as growing, but not yet-ready-to-leave-the-herd males. My best guess is that as much as 400 meters separated the various members of the herd as they stretched out along the river. At one point, the matriarch let it be known that it was time to move on. Frankly, we are not sure whether she communicated her summons through her feet or her voice. However, there is not doubt but that the other members of the herd received and understood the summons. Shortly, the matriarch began to walk up the road leading from the river to the north bank. The other members of the herd also began to ascend the north bank, but interestingly, they each chose different paths. 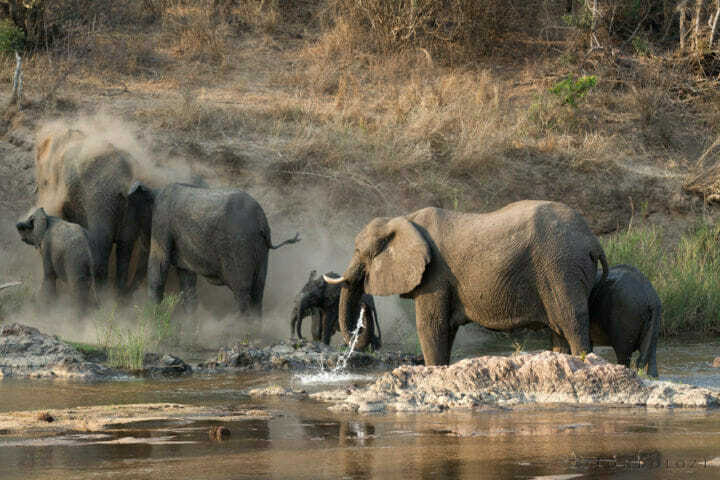 Some, who were close to the matriarch when she issued her summons, followed her directly, trudging up the same road. Most, however, took other routes. They all had the same destination, and each keenly felt their connection to and association with the herd. Yet, they chose their own way of getting to the desired point. 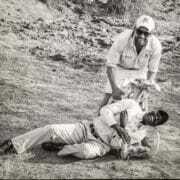 They acted as individuals while remaining a part of and within their community. This behaviour reminded us of something that Linda is very fond of saying: there are many paths up the mountain. 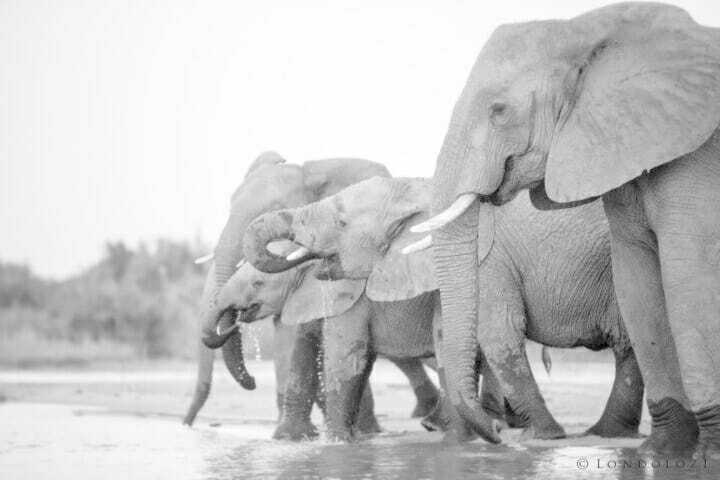 While pursuing a common objective, these elephants exercised their own initiative. While acting with a uniformity of purpose, they acted separately. Their individuality was not lost in the commonality. Each was free to achieve the collective objective in their own way. We humans should learn from this, allowing our fellow humans the freedom to be expressive and different, choosing other paths up the mountain. Uniformity is the death knell of creativity. The second lesson grew out of the exact same elephant behaviour. Although we did not time the event, our best estimate is that the herd took almost thirty minutes to fully leave the river in response to the summons. Even the matriarch adopted a crooked-line approach. Simply stated, the elephants meandered. Some continued to eat and didn’t move to follow for some time. Others continued their exploring far down the river. A few did everything: stopping to eat, stopping for a drink, stopping for a dust bath, stopping to scratch against a sturdy tree. The summons from the matriarch was real and not to be ignored. Yet, the elephants continued to enjoy what they were doing as they complied. There was no drop-everything attitude and mad rush up the hill. There was no race to see who could comply the quickest. There was no the-shortest-distance-between-two-points-is-a-straight-line approach. This cannot be overstated – the elephants enjoyed the doing, the getting there, not just the destination. The third lesson is an offshoot of the first two. Elephants are patient. They cover immense distances without hurrying. They can destroy a whole tree while feeding, but they take each branch as it comes. They are not in a hurry to finish. Instead of insisting that the herd respond immediately, directly and without delay to her summons, the matriarch even allowed her youngster to finish foraging before moving up the bank. There was no time limit, no deadline. There was no scolding because one of the elephants was a few minutes late. We humans can learn from this, being patient with others, but, more importantly, being patient with ourselves. Don’t impose artificial deadlines that only create stress. Choose your own path. Meander. Enjoy. Be patient. All are simple lessons that we learned from elephants in one afternoon. Oh, and one more thoroughly practical lesson. After watching elephants devour trees and bushes with incredible thorns, chew your food well before swallowing! Lovely blog Tom. It is so true, nature teach us many life lessons. Oh how splendid! I too have learned so much from elephants and yearn to be with them. Thank you for sharing your love for them. Read this to my family…very insightful and lessons for us to be mindful of in the bush and in life. Thank you! What an awesome story about learning, I’m going to work on incorporating these into my everyday life. Thanks so much for sharing your experience. Great post Tom. Thanks for sharing! What a rare treat, Tom, to not only enjoy your writing talent but receive insightful and thought provoking life messages as well. Wildlife brings a plethora of learning lessons as they unfold before our eyes. Hopefully we have the eyes to not only see, but a open heart and mindfulness to receive. 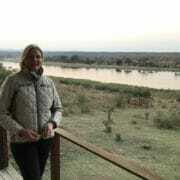 I can easily see why Londolozi has become a special haven for you and your wife. So my thanks for writing this very thoughtful blog. I’m also extending my thanks to James Tyrrell for his exceptional images that visually sealed the storyline perfectly. intelligent and have so many talents. Love these elephants. Londolozi is my favorite place on earth also. 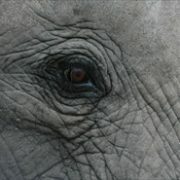 A wonderful blog Tom, highlighting the special traits of elephants. In viewing them over the years, I’ve come to believe that they are the kindest and wisest members of the mammals. I had the good fortune to spend 8 days with several elephant families whilst sitting on a small boat on the Chobe River in Elephant Bay, watching their dusty entrance led by the matriarchs into the cool water to drink and play, when not observing them in the forest of the Chobe National Park. There was a definite hierarchy but as you stated, each member moved at their own pace, eating, nuzzling one another, caring for the babies by stopping to nurse….. absolutely beautiful!! Thank you for sharing. Beautifully written . . . if only it could be put on every person’s Facebook, Instagram, Twitter & all other social media feeds every day . . . I have no doubt that the world, and particularly the U.S. would be in a better place. Fantastic storyline here! 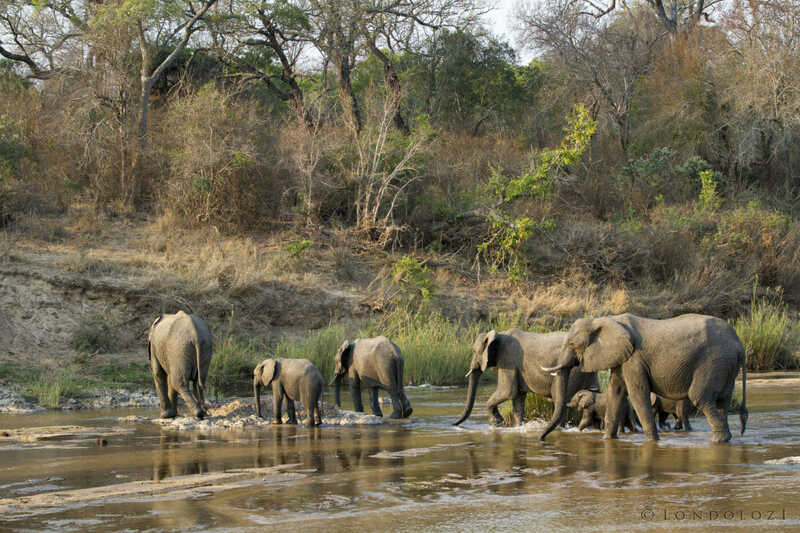 We learned so much from our first encounter with an elephant herd crossing a river. My strongest takeaway was the clear caring the females had for their young ones–allowing them to play, but staying close.